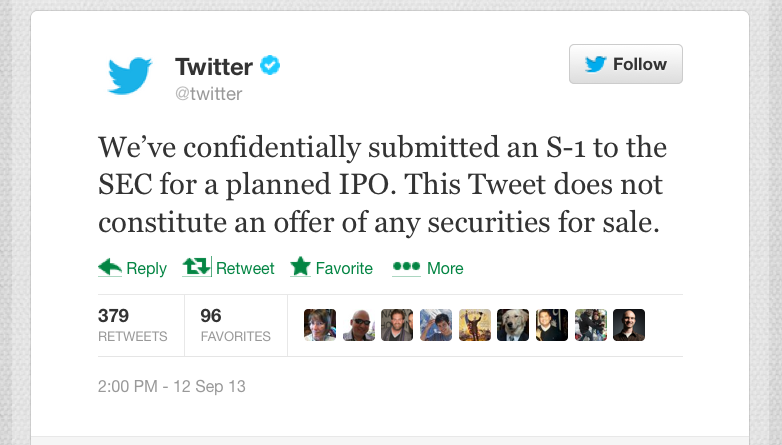 Twitter Just Filed a Secret IPO—Why 'Secret'? Twitter is going public, the company announced today (via Twitter). It's submitted its S-1 document, which contains all sorts of juicy information about the company's business and risks ... but secretly. So, the company is going public privately? Who said they could do that? Well, Obama said. Last year, the president signed the Jumpstart Our Business Startups (JOBS) Act, which let small companies -- those making less than $1 billion in annual revenue -- keep their filings private until three weeks before their road show. Twitter isn't projected to make $1 billion in revenue until next year. "Keeping its IPO filing secret until the last minute could help Twitter avoid the overheated anticipation that Facebook had to deal with ahead of its disastrous IPO," Zach Seward explained in Quartz. Indeed, Facebook's IPO was totally disastrous, as you might recall, and much of the disaster was precipitated by last-minute changes to the S-1. As Khadeeja Safdar explained for The Atlantic in a long investigative piece, Facebook cut its earnings forecast weeks before its public debut, which scared away most of the support from large institutional investors. It's very likely that this is why the stock flopped on its opening day -- the big money had lost interest. This provision of the JOBS Act is supposed to protect smaller companies from a similar fate and encourage more firms to go public by making the road to IPO less fraught. At the same time, Twitter's S-1 is going to come out eventually (publicly announcing a private filing seems like the first step) at which point the madness will continue as regularly scheduled: Twitter will tell institutional investors how great they are; analysts will set their targets and phone in recommendations; and CNBC will titillate retail investors will the loudest analysts around.